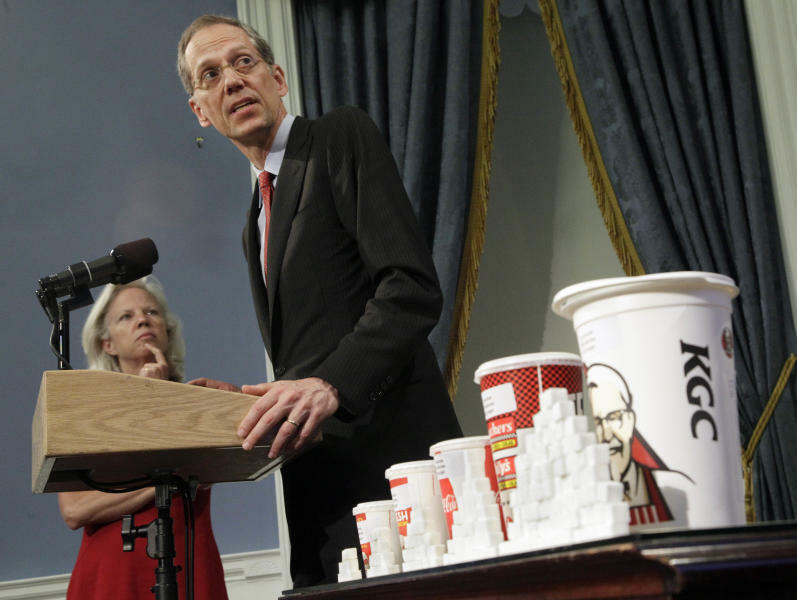 NEW YORK (AP) — Want to super-size that soda? Sorry, but in New York City you could be out of luck. 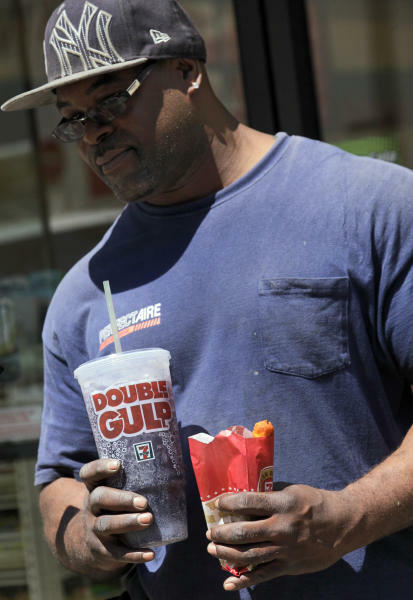 In his latest effort to fight obesity in this era of Big Gulps and triple bacon cheeseburgers, Mayor Michael Bloomberg is proposing an unprecedented ban on large servings of soda and other sugary drinks at restaurants, delis, sports arenas and movie theaters. Drinks would be limited to 16 ounces, which is considered a small serving at many fast-food joints. "The percentage of the population that is obese is skyrocketing," Bloomberg said Thursday on MSNBC. He added: "We've got to do something." It is the first time an American city has directly attempted to limit soda portion sizes, and the soft-drink industry and others bitterly accused the three-term mayor of creating a "nanny state" and robbing New Yorkers of the right to decide for themselves. "The people of New York City are much smarter than the New York City Health Department believes," Coca-Cola Co. said in a statement. "New Yorkers expect and deserve better than this. They can make their own choices about the beverages they purchase." The ban is expected to win approval from the Bloomberg-appointed Board of Health and take effect as soon as March. City officials said they believe it will ultimately prove popular and push governments around the U.S. to adopt similar rules. It wouldn't affect diet soda, any drink that's at least 70 percent juice, or one that is at least half milk or milk substitute. Nor would it apply to drinks sold in many supermarkets or convenience stores. Businesses would face fines of $200 per failed inspection. City officials said some calorie-heavy drinks such as Starbucks Frappuccinos would probably be exempted because of their dairy content, while Slurpees and Big Gulp drinks at 7-Eleven wouldn't be affected because the convenience stores are regulated as groceries. Bloomberg said people who want to guzzle soda would still be free to order more than one drink. But he said restricting servings to 16 ounces each could help curb consumption. "You tend to eat all of the food in the container. If it's bigger, you eat more. If somebody put a smaller glass or plate or bowl in front of you, you would eat less," the mayor said. In announcing the proposal, health officials cited research linking sugary drinks to rising rates of obesity, diabetes and heart disease. At the same time, City Health Commissioner Thomas Farley said the city has no intention of reducing portion sizes of solid foods. "Sugar drinks are not the entire obesity epidemic, but they are uniquely, strongly associated with this rise in obesity over the last 30 years," Farley said. "There's something about sugar water, as a product, which leads to long-term weight gain." The commissioner estimated that obesity-related illnesses in New York City cost $4 billion a year. Kelly Brownell, director of the Rudd Center for Food Policy and Obesity at Yale University, said he believes the ban would be effective. "Soft drinks are the single greatest source of added sugar in the American diet," said Brownell, who has campaigned for a soda tax to cut consumption. Stefan Friedman, spokesman for the New York City Beverage Association, argued the ban would do little to reduce New Yorkers' waistlines, pointing to federal data showing that calories from sugary drinks are a declining portion of American diets even as obesity increases. At a Burger King in Manhattan, retired postal worker Bobby Brown didn't like the mayor's idea, saying people should be "free to choose what they drink or eat." But Joseph Alan, a chauffeur eating at a nearby Subway, said his overweight friends' eating habits ultimately affect him, too: "I tell them, 'This is affecting our insurance, because charges go up more treating people with diabetes and other health problems. I don't want to pay more for health insurance so people have these drinks!'" Under Bloomberg, New York has campaigned aggressively against obesity, outlawing trans fats in french fries and other restaurant food and forcing chain restaurants to list calories on menus. The mayor has also led efforts to ban smoking in the city's bars, restaurants, parks and beaches. 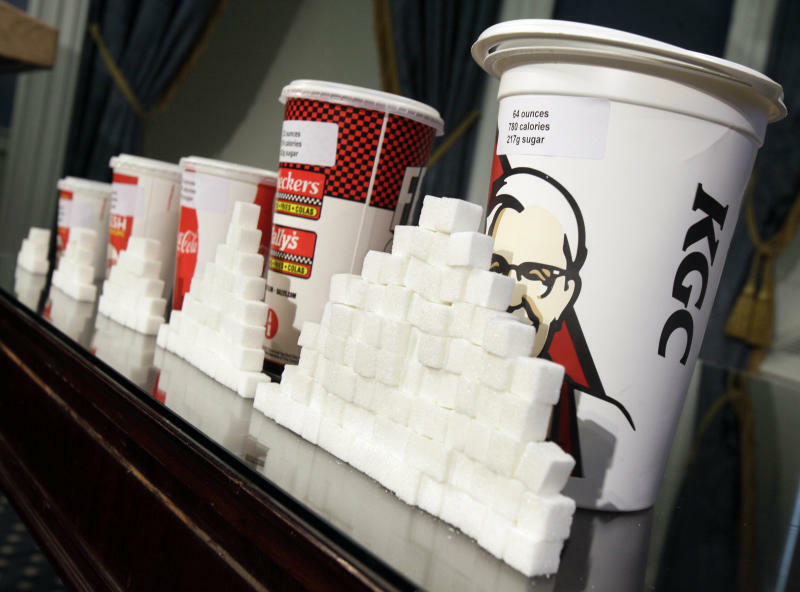 His administration has tried other ways to discourage soda consumption. The mayor supported a state tax on sodas, but the measure died in the Legislature, and he tried to restrict the use of food stamps to buy soda, an idea federal regulators rejected. Legal experts said the soft drink industry may mount a challenge to the new rule by arguing that it's arbitrary or internally inconsistent. Given that you can't buy a 32-ounce serving but you can buy two 16-ounce ones, "a court might say that all it does is help the cup industry by making people buy more cups," said John Humbach, a professor at Pace Law School. But he called that approach "a long shot." Mark Kalinowski, an analyst with Janney Capital Markets who covers companies such as McDonald's, predicted an uproar. "Folks who want to buy Big Gulps and Frappuccinos, a lot of those customers, you're only going to be able to take it away from them by prying it out of their cold, dead hands," he said. If the ban goes into effect, he said, customers will probably just respond by ordering two drinks. "Maybe the mayor can outlaw all soft drinks and outlaw all fun while he's at it," Kalinowski scoffed. AP Food Industry Writer Candice Choi and writers Karen Matthews and Verena Dobnik contributed to this report.